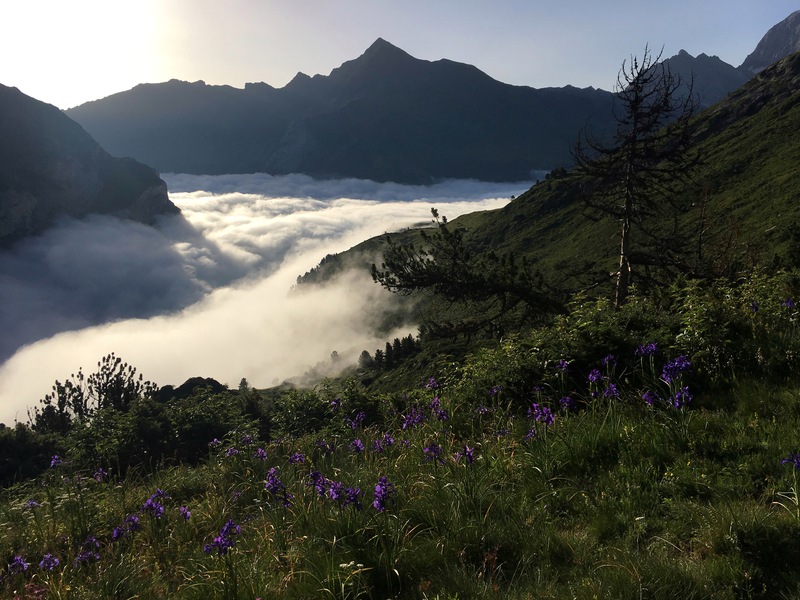 I got going about 7:45am for a relaxed 1.5hrs of downhill into the touristy village of Gavarnie. Once again, I got to drop down and below the low lying morning fog. Not sure I could ever get tired of this cool mix of fog and sun with the mountains most mornings. 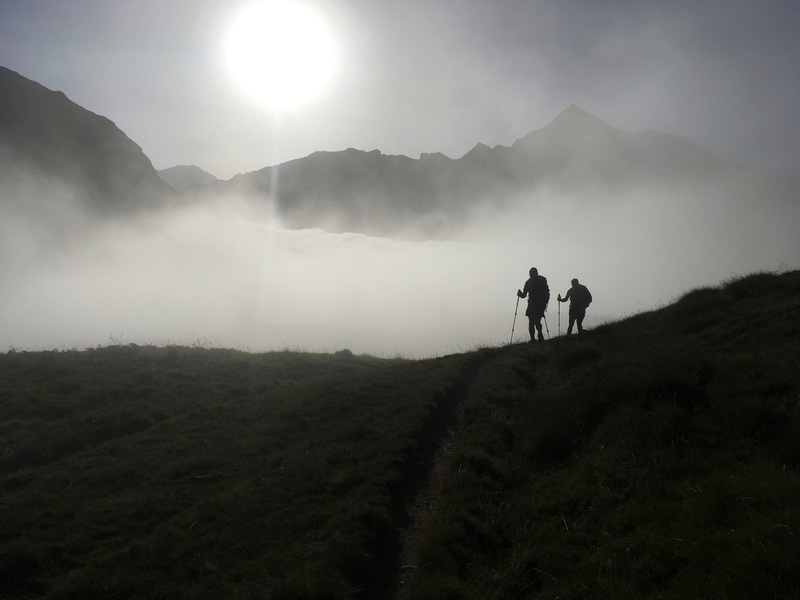 The fog was still low, but starting to clear when I popped out to the road and walked into Gavarnie. JB came into town not long after me. Since it’s Bastille Day here, he was not able to get his package and letters from home that one of the women at the tourist center (also the post it seems) even saw sitting in the back. He held his frustration in so much better than I would have on that one knowing it was within reach and he had to choose to return it to sender or wait through the three day weekend. He sadly chose to return them and hiked on today. Bummer. We have slightly different routes and might overlap in the future over the next month. Thankfully everything else was open in town. I ate light this morning to treat myself to a great big breakfast, but was disappointed to find out I couldn’t get anything other than a pastry and hot chocolate until noon. The French just don’t seem to do breakfast like Americans do. Either that or I waited too late (10am) to ask and they kinda shut down from 10am-noon. I’ve stopped trying to make sense of it. 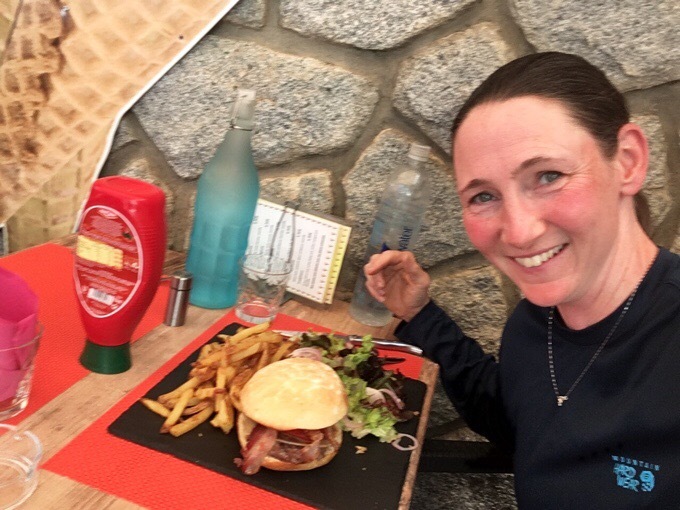 I couldn’t check into my gite until 2pm, so I got the next 2 days of food at the tiny grocery shop, sat at the cafe with JB and another hiker, and had my burger at noon while doing email and blog posts. Thankfully, I had phone service cause there was only wifi at the info center. I miss my chocolate milk, but got some great chocolate ice cream! 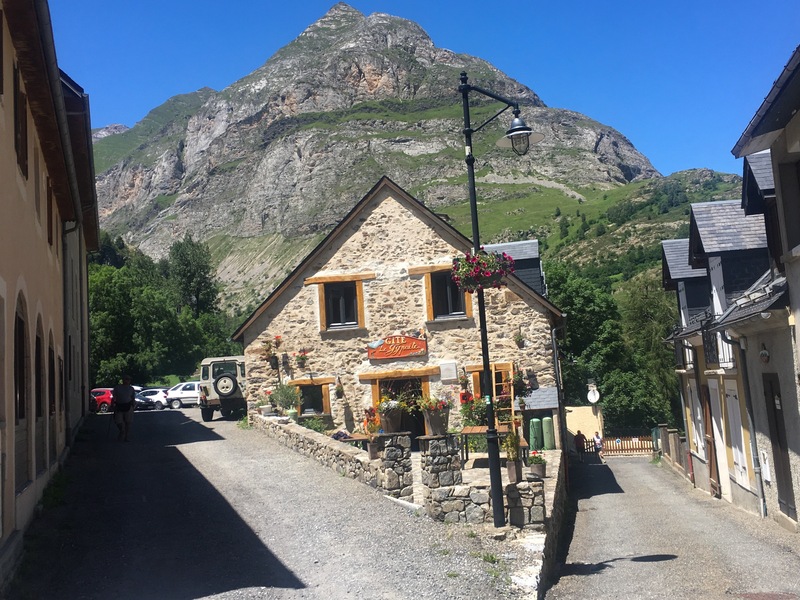 I checked into the Gite d’Etape le Gypaete, which is just €15/$17. An amazing deal, but I got what I paid for this time. They spoke French and Spanish, and had very little patience with me. This is the first this has happened to me, and it was frustrating. Basic questions as to laundry, price, check-in time, wifi, etc just annoyed them further in my sincere, yet broken Spanish as they replied more and more curt. I almost said forget it and walked back to the camping ground, but it was a mile back and I needed a place to charge things. I decided not to buy the dinner here though it did seem quite plentiful and very social. I think that’s their main focus. Another girl staying here that speaks french said they were even short with her, so apparently it wasn’t just me. JB wasn’t a fan of the the town at all also feeling like people were just seeing us as dollar signs than humans. Oh, did I mention there aren’t any toilet seats either. Classic. There’s no laundry in town (at the campground), so I had to do just rinse in the sink and hang dry out back. I think I would have liked it more if I had my own room. The dorm room I’m in has the shower and sinks in the room. Like and open ceiling and just a curtain to close off the shower and you have to depress a button to make the water come out for 10 seconds at a time. Oh, and one electric plug (not even two sockets, just one) in the whole room for up to 7 people. The kicker is it’s up on the wall so things like my battery can’t charge cause it can’t hang. I had to devise a hanging bag solution with my stuff sacks. I will say at least the wifi works, which I had to convince them that I wasn’t stupid and entering the code wrong and that the router needed to be reset. It took three times trying to explain to the man and woman in charge. They even walked away from me in frustration before I got them to believe me that they needed to reset the router. I was happy to just barely get to Skype with my sister and nephews who tolerated the in and out reception. I got to show them the mountains outside (they live in Chicago). My sister let me know her oldest is into reading the blog at night and is actually getting into it. 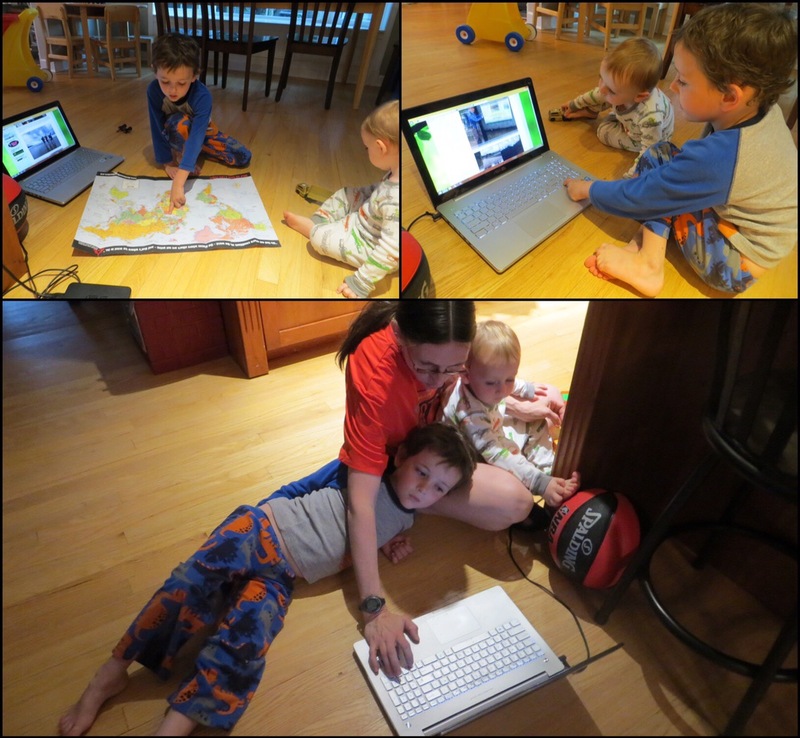 They know Aunt Erin hikes and like seeing the photos and animals, but this is the first one has gotten into he blog. I should use the word poop more often just for him. I know he just got a kick out of that one! I love these photos of him reading before bed. I did get to relax and catch up on things, so that was nice. This next leg is a doozy. Supposedly the most difficult of the whole hike and not to be attempted in foul weather. I’ve been super fortunate with weather, but thunderstorms are forecasted to move in in five days or so. I think I can just make it though the section (or most of it) before the storms come if I push. Not preferred, but better than being forced low or miss it all in fog and clouds. I’m well rested, so I’m going to get going early tomorrow and turn on the jets for the next five days. I may not have service again until the end of that leg, so again, the posts may come in one bulk send out. Goodnight…there’s a snorer already hard a work in the room I’m in. White Noise app to the rescue! Are you getting your water from the lakes Erin? And are you purifying or just drinking it straight ? I’m not treating when I get it at the refuges, but treat all other sources as I’m a bit more paranoid than most. Avoid water from lakes or any other still water, so far as possible. Things breed in it. Running water is better the higher up you are. Above 2000m I will usually not bother to treat it unless i see sheep/ cattle around too. 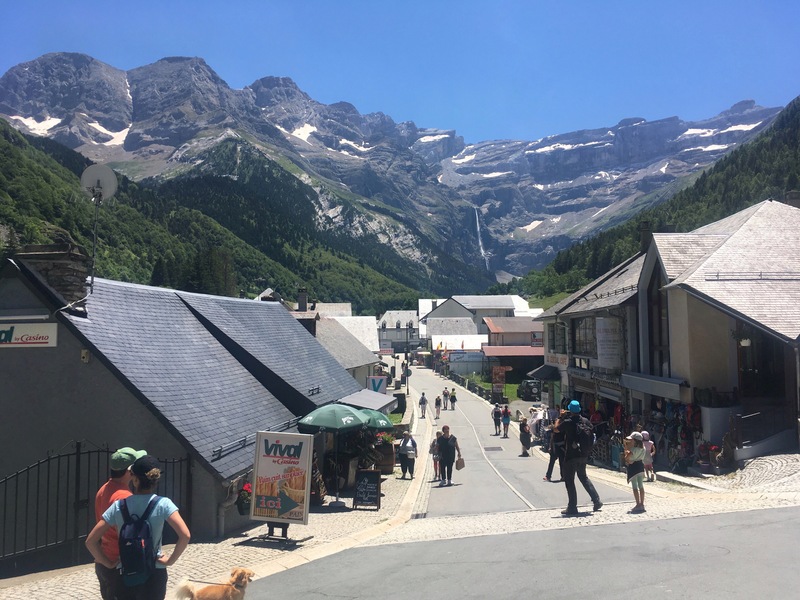 What a “perfect” leg of the hike to finish…even if the town isn’t so perfect. It looks so beautiful over there! Ha, I seem to be the only person I know that quite likes gavarnie! 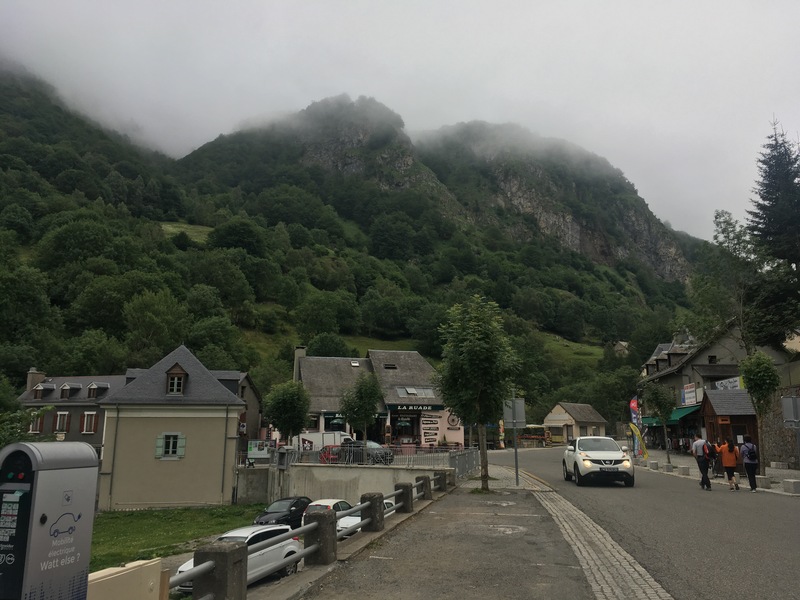 Though I haven’t been to the gite d ‘etape.. sorry they were chippy Erin, most are fine but there are one or two like that. Gavarnie is a bit seedy, out always reminds me of a seaside town, which is a bit ironic given how high up it is. So, sounds like it was good that you came into town fully charged, but charging up your devices was more challenging. A super lightweight solar panel might help, if this is such a thing. I know solar charging exists, but not sure how heavy it is, or how effective in filling up a charge. Hope this next doozy of a bike goes well and rewards you in many ways. The big American breakfast isn’t a thing in France, as you’ve discovered. You might want to try asking for a croque monsieur – or two! – (or croque madame which includes a fried egg) at cafes/ bars/small restaurants https://en.m.wikipedia.org/wiki/Croque-monsieur. Or get a baguette at the local boulangerie (bakery) and your choice of innards from whatever’s available at the local store. You’ll get bigger meals at lunch or dinner time, but they’re still not likely to be super-sized US-style ones. Totally loving your blog and photos. 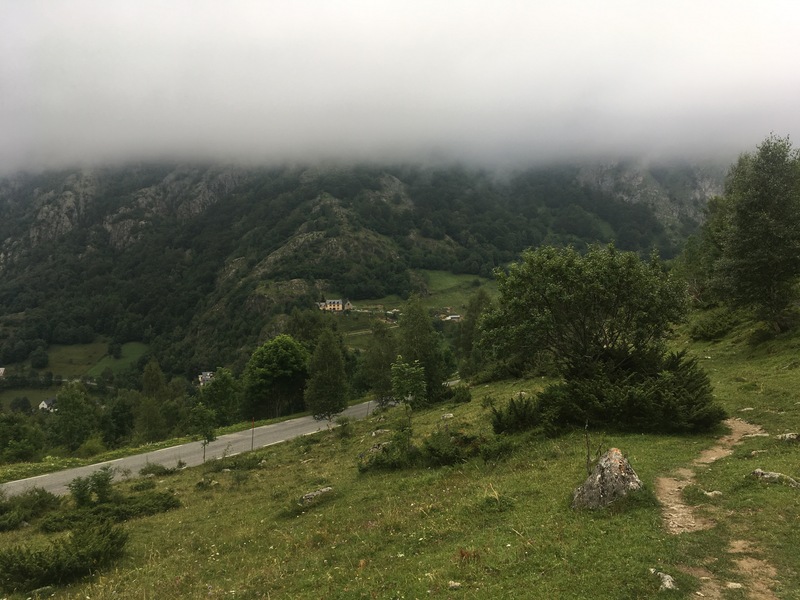 I’m also watching the Tour de France bike race, currently in the Pyrenees, and am gaining a real appreciation from you and their coverage of the fog/clouds and how quickly the weather can change there. Your fog pictures are just amazing. Have you ever considered a solar battery pack that attaches to your backpack? The newer models are becoming efficient at charging and can still be plugged in. Could save the stress of finding power points. I used solar my first two years of thru hiking and it wasn’t reliable enough. Now just carrying a larger battery that charges once every week or more in town is much easier. Solar would only be considered if I knew I wasn’t coming into contact with towns much. Tons of towns here.